Although right next to each other, Belize and Guatemala are two remarkably contrasting countries. Guatemala offers picture perfect colonial towns surrounded by lofty volcanoes, lively indigenous markets, mysterious Mayan ruins and the exquisite sparkling waters of Lake Atitlan. Belize has jungle that teems with wildlife, some of the best snorkelling in the world, blissful white beaches and superb adventure activities. This tour combines the highlights of both in an exciting two weeks. Belize is not one of Central America’s cheaper destinations. Prices do vary significantly depending on the season but are generally highest over Christmas and Easter whereas there are quite significant savings to be had if travelling during July and August. The exact cost will also depend on how many of you there are and whether the children will share a room with your or will have their own room. One other major factor in determining the price in Belize is whether you choose to self-drive or be escorted by an English speaking driver-guide. (Note that if you are combining Belize with Guatemala, we do not offer self-drive holidays in Guatemala). As a guideline, the price for a two-week holiday for a family of four in Belize will start from £7,500 (excluding your international flights). This is based on a self-drive programme in comfortable mid-range jungle lodges and beach hotels but most activities are not included (as these need to be arranged and paid for locally). This is for travel during July and August. If you choose to be escorted by a private chauffeur guide throughout, the price for a two week holiday for a family of four will start from £10,000 (travelling in July and August). This includes most activities and some meals but excludes international flights. If travelling at Christmas or Easter, the price for a two week tour for a family of four will start from £8,500 for a self-drive tour and £11,500 for a chauffeur-escorted tour. There are also some fabulous boutique hotels in Belize, both inland in the jungle and also on the beach. If you would like to use these hotels, the price for a two week holiday for a family of four will start from £10,500 for a self-drive tour and £14,000 based on private chauffeur-driven transport. All prices exclude international flights. There are no direct flights to Belize so most people transit in the US. Prices start from around £550. We can organise flights for you from any airport so please contact us for a no-obligation quote. There are no age limits on any of our holidays. 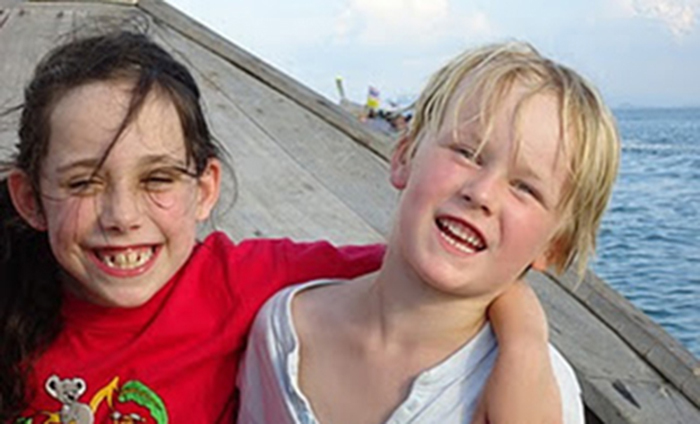 We will tailor the itinerary to the ages of your children and can accommodate everyone! All you need to do is let us know a few key details about you and your family and we will do the rest. We will produce an itinerary that we think will suit you but you can review this as many times as you need to until we get it just right. When you arrive in Guatemala City your guide will meet you and whisk you away to the beautiful old Spanish colonial city of Antigua, about an hour away. Take a guided walking tour around the impossibly pretty town of Antigua. The cobbled streets are flanked by brightly coloured houses, exquisitely carved colonial facades loom above imposing plazas and above it all tower three different volcanoes. The children will particularly enjoy the indigenous market where stalls are crammed with vibrant tapestries and local women in traditional dress weave through the narrow alleys with woven baskets of produce balanced on their heads. This afternoon take an excursion to Pacaya Volcano, following a picturesque trail that winds up through woodland and then cinder scree to the impressive crater and lava flows. You will have dinner on the volcano itself (pudding will be marshmallows freshly toasted over lava) before returning down the mountain by the light of your head torch. After breakfast visit a traditional coffee farm just outside Antigua. Here you will learn everything from how the coffee beans are picked to how the processed coffee is packaged, in other words the entire journey of the coffee bean from the plant all the way to your cup. Later continue to Panajachel on the shores of Lake Atitlan where you can browse the textile stalls and markets before continuing by boat to your cliff-side lake front hotel. The view from the hotel over the lake and surrounding volcanic hills is completely breath-taking and one of our favourite spots in Central America. Today you will make the most of the beautiful surroundings, starting with a kayak trip around the lake to the indigenous village of San Marcos. From here, a gentle 2hr hike will take you along the lakeshore back to your hotel. The afternoon is free for you to relax in a hammock and enjoy the beautiful gardens but if you have the energy there is also a lovely short hike along an ancient Mayan trail to the neighbouring village. An early start this morning to get to the world famous market at Chichicastenango whilst it is in full swing (Thursdays and Sundays only). This is truly one of Central America’s great experiences, a small town of adobe houses on cobblestone streets that on market day attracts thousands of vendors from throughout Guatemala who come to sell their produce. Wander through the narrow alleyways between the stalls and marvel at the sheer quantity of things for sale… wooden masks, exquisite embroidery, pottery, machetes, woodcarvings, ethnic bags, piles of fruit and vegetables, traditional incense, candles, medicinal plants and so very much more. Later head back to Antigua for the night. This morning transfer to Guatemala City airport to catch a short flight up to Flores. From here it is just a short drive to Tikal where you will enjoy an afternoon’s guided tour of Central America’s most impressive Mayan ruins. The children will love scrambling up the side of some of the more precipitous temples and listening to the racket from the howler monkeys in the surrounding jungle. They will be entranced by gruesome tales of human sacrifice during Mayan times and will enjoy a short walk through the jungle to spot toucan and spider monkeys. First stop today are the atmospheric lake side ruins at Yaxha. Although smaller and perhaps less impressive than Tikal, these are also considerably less visited and all the more lovely as a result. There are some very steep sided temples that older children will enjoy scaling for superb views over the site and the lake beyond. From here you will leave Guatemala behind and head to Belize. You will spend two nights in a lodge nestled deep in the rainforest above the Macal River. Today families with older children will love a visit to Actun Tunichil Muknal (ATM). This Mayan sacrificial burial site is contained within a cave system and it is a thrilling day as, armed with head torches you climb over rocks, wade and swim to reach the inner chambers. Here you find examples of Mayan pottery, ceramics, and of course the mysterious Crystal Maiden herself, whose calcified remains are covered in shimmering limestone crystals. Set off for Belize City then continue by boat to Caye Caulker. This afternoon take a bare-foot wander (as the locals do) around the streets where the colourful painted houses contrast with the pristine white beaches. There are no cars so this is a wonderfully relaxing place to explore. Finish the day in one of the many fabulous seafood shacks on the beach. A full day to kick off your shoes, bask in the warm sea breeze, soak up creole culture and enjoy Caribbean island life. This is the perfect place to recharge the batteries! Day 11 Caye Caulker – Hol-Chan Marine Reserve/Shark Ray Alley. After a leisurely breakfast take a morning boat trip to the world famous Hol-Chan Marine Reserve and Shark Ray Alley just off Ambergris Caye. This is one of the world’s best snorkelling and diving sites and the marine wildlife is truly incredible. You will be snorkelling with docile rays and nurse sharks up to 4-6 feet in length and will also hope to see sea turtles, dolphins and, if you are very lucky, even manatee. Day 12 Crooked Tree Wildlife Sanctuary. After a relaxing morning take the boat back to Belize City and head north to the famous Crooked Tree Wildlife Reserve, a 300 year old, 16,400-acre sanctuary and bird-lover’s paradise. Day 13 Crooked Tree Wildlife Sanctuary. You have a morning boat ride in the sanctuary with a local naturalist guide. The beautiful wetlands of Crooked Tree are one of the most important bird habitats in Belize, and home to rare species like chestnut-bellied herons, black-collared hawks, and huge Jabiru Storks (the largest flying bird in the Americas). The children may be more excited by the local populations of turtles, black howler monkeys, crocodiles and iguanas. This afternoon perhaps hire a kayak to head back out onto the lagoon or follow one of the many nature trails on the lookout for more wildlife.